Who bit me? Identify your bug bites now! > Blog > Pest Information > Who bit me? Identify your bug bites now! It can be difficult to distinguish between different types of bug bites. Peek below to learn the identifying characteristics of following insect bites. Summer is the season for mosquitoes. These tiny members of the fly family can put a real damper on your outdoor activities. Mosquitoes live in grass and bushes and typically breed in standing water. Only female mosquitos bite leaving behind an itchy welt. These welts become red, hard and swollen almost immediately and receiving multiple bites around the same time is very likely. 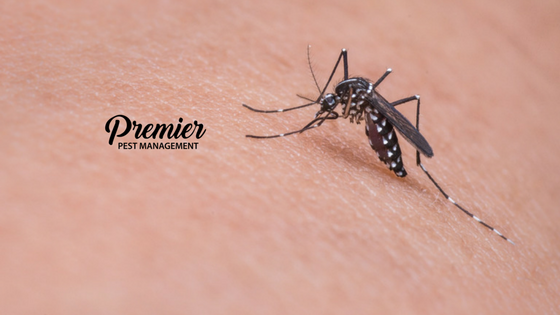 The biggest threat with mosquitos is that they can spread diseases between animals and humans and from one human to another. Protect yourself by removing standing water near your home, maintaining your landscape regularly, installing screens in your windows and using insect repellent outdoors. Bed bugs can be anywhere. They get into your bed, furniture, carpets and more. They are excellent travelers and can be picked up in hotels, hospitals, places of business and more. Bed bugs are small, flat and oval shaped. They are most active at night and commonly bite areas of your body that are exposed when you’re sleeping such as your face, arms, legs, and hands. Typically, bites have a dark red center surrounded by a swollen and red area. They can be in a line or grouped together in a small area. Bed bug bites are incredibly itchy and you may notice a slight burning sensation at the bite site. Unlike some of their insect buddies, bed bugs do not transmit any other diseases. If you suspect you have been bitten by bed bugs, its important to contact us right away to avoid an infestation. Ticks have arrived here in Saskatchewan and pose a potentially serious threat to our health. They live in grass, trees, shrubs and leaf piles and are attracted to both people and animals. Ticks can move from pets to humans and vice versa. Most bites are harmless; however, some ticks can pass serious diseases, including Lyme Disease, on to you. These blood suckers are quite small and brown to reddish brown and black in color. Ticks prefer warm, moist areas of the body and tend to take up residence in your armpits, groin area, and hair. When they get comfortable they bite to begin drawing blood. Ticks remain attached to your body after they bite you, which makes it easier to identify their bite. With a bite, you generally notice no symptoms, however, some people may experience pain, swelling, a rash, a burning sensation, blisters or difficulty breathing. These common pests do not need to ruin your day. Protect yourself from insect bites and always treat your symptoms accordingly or see your health care provider for more serious cases.